iPhone assembler Wistron has confirmed that at least one of Apple's next-generation iPhone models will be "waterproof" and include wireless charging capabilities, according to Japanese website Nikkei Asian Review. "Assembly process for the previous generations of [iPhones] have not changed much, though new features like waterproof and wireless charging now require some different testing, and waterproof function will alter the assembly process a bit," [Robert] Hwang, [Wistron CEO], told reporters after the company's annual shareholders' meeting on Wednesday. Apple analysts Jeff Pu of Yuanta Investment Consulting and Arthur Liao of Fubon Securities claim Wistron is splitting orders for the upcoming 5.5-inch iPhone with a flat display with larger Apple manufacturing partner Foxconn, so it's likely that Wistron is referring to the so-called "iPhone 7s Plus." Given the higher-end "iPhone 8" is expected to be a premium smartphone, positioned above the iPhone 7s Plus, that model will likely feature wireless charging and improved water resistance as well. That leaves the next 4.7-inch iPhone, which is already rumored to have wireless charging, and it's reasonable to assume the smaller model will have improved water resistance too. 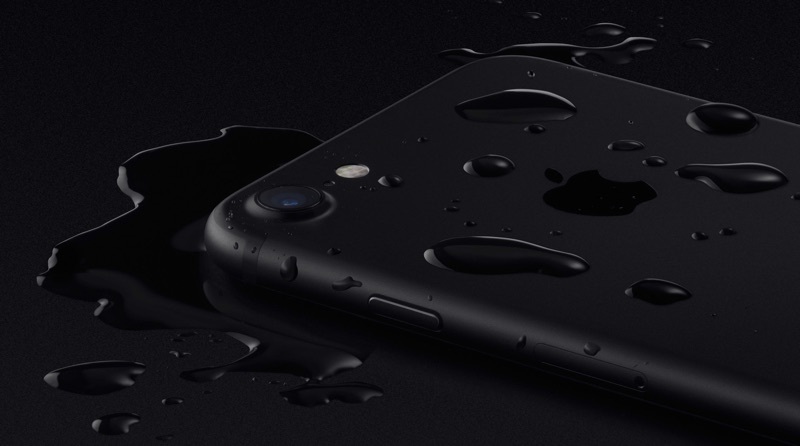 iPhone 7 and iPhone 7 Plus models are already splash- and water-resistant with an IP67 rating, but Apple's fine print warns that "splash, water, and dust resistance are not permanent conditions and resistance might decrease as a result of normal wear." iPhone water damage is not covered by Apple's warranties. Nevertheless, many iPhone 7 and iPhone 7 Plus users use their smartphones in the shower, for example, without issue. A report earlier this year said Apple's next iPhone models will feature improved IP68-rated water resistance. In the IP68 rating, the "6" means the next iPhone would remain effectively dustproof, with "no ingress of dust" and "complete protection against contact," while the "8" means the device will be even more water resistant. Samsung's Galaxy S8, which already has IP68-rated water resistance, is able to withstand 1.5 meters of water for up to 30 minutes. Soon to be former Apple supplier, that is. It's nice to think that somebody at Apple was paid to splash water on iPhones in an aesthetically pleasing manner and photograph the results. They probably spent hours on this. The most eye-popping feature will be the price tag. My Jet Black iPhone 7+ was $969 + tax and my space black watch was $1100 + tax. You must not be familiar with Apple's pricing. You might want to change "waterproofing" to water resistant, which would be more apropos and accurate, given the content of your article. "Given the higher-end "iPhone 8 ('https://www.macrumors.com/roundup/iphone-8/')" is expected to be a premium smartphone, positioned above the iPhone 7s Plus, that model will likely feature wireless charging and improved waterproofing as well." Tons of confusion about the ratings. Certainly not going to be "waterproof" under the rating system. The confusion comes in regarding the 8 rating. The 8 rating is given when the manufacturer, not an independent testing org, certifies the phone to be water resistant for 30 minutes at ANY depth beyond 1 meter. For example, Samsung's Galaxy 7 was IP 68, (don't know about the 8) but only certified up to 1.5 meter depth. It's up to you to decide if Samsungs certification of half a meter more than Apple iPhone 7 is meaningful or just a marketing gimmick. Apple could pick 1.1 meter and get the new rating, but I am sure they will equal or exceed Samsung's claimed depth. Since the iPhone 7 clearly was able to resist water intrusion beyond 1 meter, my speculation is that Apple didn't claim the IP68 rating because they knew submerging in water up to 1meter for 30 minutes would cover 99.9% of reasonable use cases and they didn't want people to do foolish things with the phone like deep water use, but since consumers were being "misled" into thinking that Samsung's IP 68 was meaningful difference, they opted to go with IP 68 with new phone. You're right. I changed "waterproofing" to "water resistance" in this particular sentence. For all other mentions of "waterproof," this is why. Wow. It's not going to be waterproof. Change the ****ing title, stop click-baiting. I suspect it might be $100 - $200 (at most) more than the top line model now. Not a huge increase (if true). And folks are always welcome to voice their displeasure with their pocketbooks.